Hey! Brianna here from Life and Yarn! I wanted to start off by telling you a bit about myself and my Maker Life! I was taught to crochet when I was little but became more passionate about crochet when I found out I was pregnant and wanted to make a blanket for my little guy. From that point on I have been crocheting non-stop. I am trained in Architecture and I primarily design homes for a living. Although I believed this was my life’s passion and worked extremely hard to make it a reality, having a baby has changed my perspective on that. My focus has now turned to following a dream of making this Maker Life a business. I was raised to believe with lots of hard work and persistence that anything is possible if you can dream it. You won’t know unless you try! More recently, my passion for crochet has gone in the direction of creating patterns and some really fun items! I truly love to create and I LOVE to see someone enjoy the process of creating themselves! I truly believe that you put a piece of yourself into everything that you make. I have been working on ways to combine crochet with other mediums so it's not just yarn. I love being creative and I don't just have a yarn stash, I have a pretty serious craft stash as well. If you want to see what I am making on a daily basis come find me @life.and.yarn on Instagram. I am so excited to share this project with you! It’s just the right amount of crochet mixed in with some really fun materials! It’s the perfect quick, yet thoughtful, project for that special someone on Mother’s Day! So let’s get started!!!! Wooden Dowels - 3/16” dia. x 12” long. Sewing thread that matches your cotton. Chain Stitch (CH) – yarn over, pull yarn through stitch on hook. Slip Stitch (Sl St) – Insert hook into stitch or space, yarn over, pull yarn through both loops on hook. Single Crochet (SC) – Insert hook into stitch or space, yarn over, pull up a loop, (2 loops on hook), yarn over, pull through 2 loops on hook. Half Double Crochet – (HDC) – Yarn over, pull up a loop, yarn over, pull though all loops. Double Crochet (DC) – Yarn over, insert hook into stitch or space, pull up a loop, (3 loops on hook), yarn over, pull through 2 loops, yarn over, pull through remaining loops. 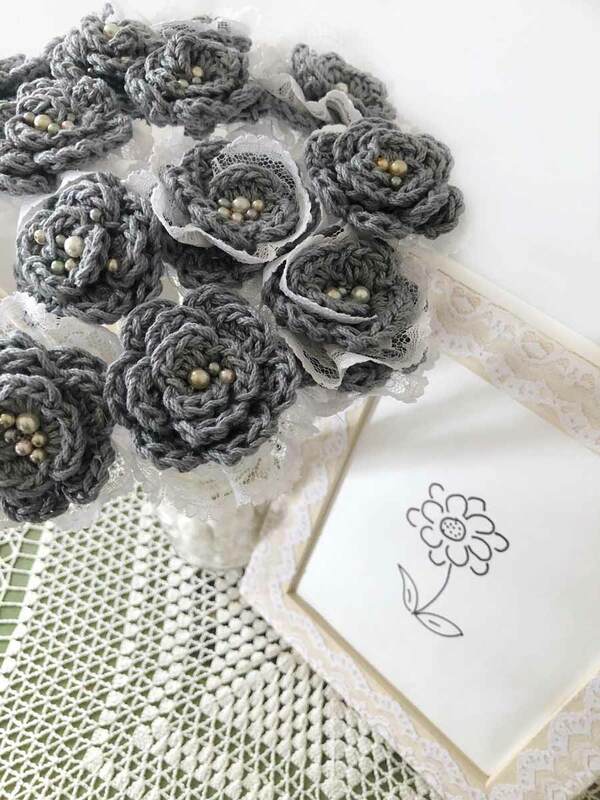 First, you will crochet the flowers but fully assemble them later. 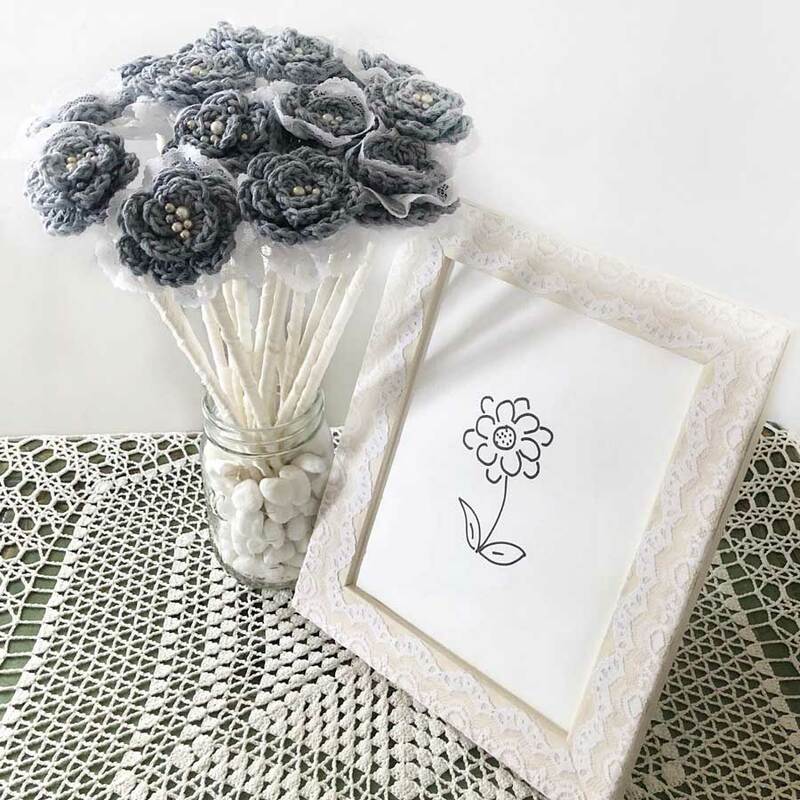 Using your 24/7 Cotton and the 4.00 mm crochet hook make your desired amount of flowers. I made 15 using my one skein and had yarn left over. SC in the 2nd chain from the hook. CH 1 and then turn. 3DC in the 1st chain 1 space. CH 1 then Sl St into the next SC stitch. * * Repeat, total of 9 DC petals. Finish off leaving a tail, approximately 12 “ long. For this part there are three different styles of flowers to choose from. My bouquet has all three. First Style – No lace only beads. 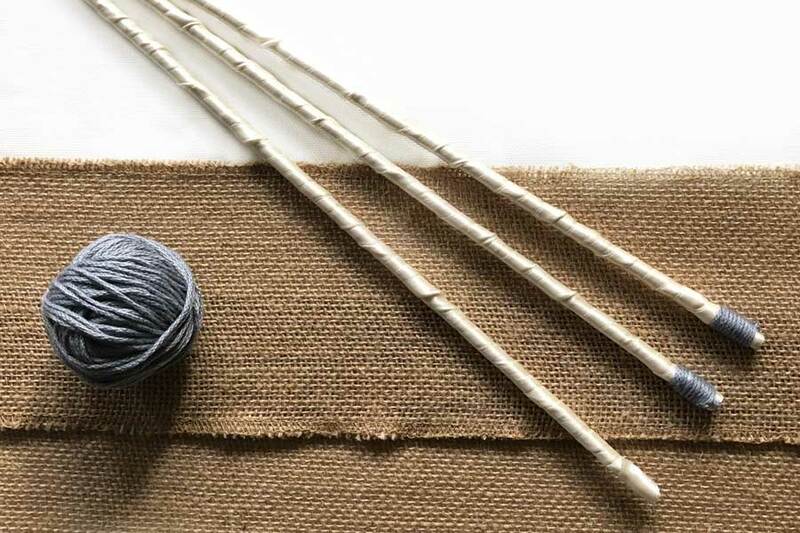 Using the long tail you left at the end of one of your flowers, thread it with your yarn needle. Fold the first HDC petal to the next HDC petal and start to sew your yarn through the starting chain. Continue to fold and wrap around your flower so that the petals are spaced nicely while sewing the long yarn tail into the starting chain. Finish off when you sew down your last petal. Once your flower is assembled, thread your sewing needle with your coordinating sewing thread. Secure your thread to the back of the flower and thread through to the front. Add a pearl bead to your thread and thread again to the back. Do not pull your thread so tight that you can no longer see the pearl bead. Continue to do this until you have your beads placed to your liking. Since this flower does not have any lace, I also put some small pearls between the petals for some added detail. 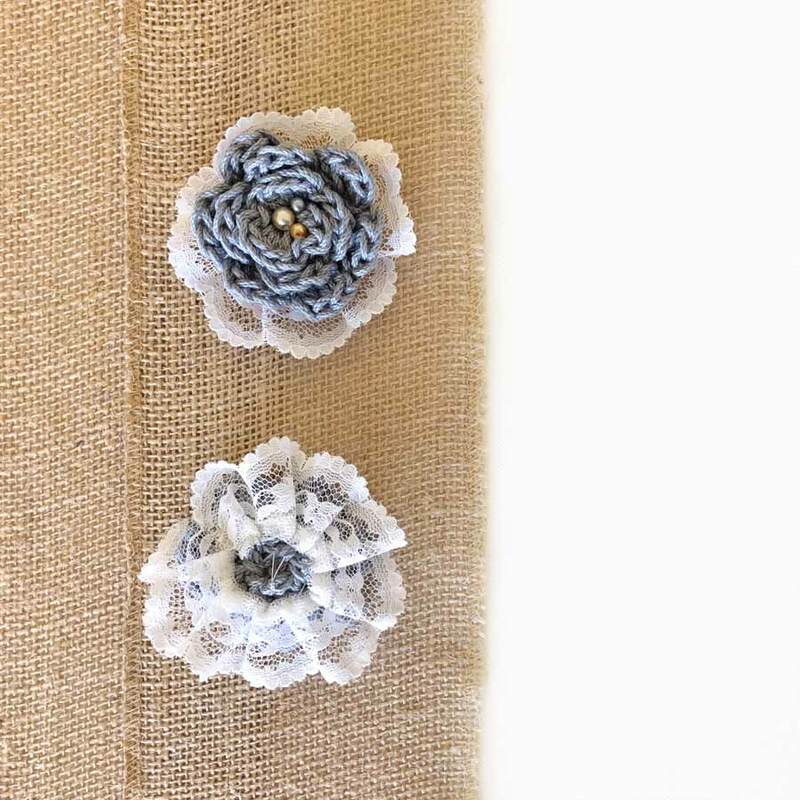 Second Style – Lace Backing and Center Beads. Assemble your flower as you did for the First Style. Thread your sewing needle with your coordinating thread. You will now be sewing the scalloped lace to the back using a pleat. A pleat is formed by folding the fabric back onto its’ self. This is necessary to make the lace curve around the back of the flower. I did approximately one pleat per petal. You may need more depending on the style of lace you chose. Finish off when you have attached your lace around the whole back of your flower. Note: I do not cut my lace until it has been completely attached. Due to the use and potential inconsistency of the pleats it is hard to determine the proper length to pre-cut the lace. Now you may add your beads as you did in the same fashion as the First Style. I only placed beads in the center of this Second Style and not within the petals as I did on the First Style. 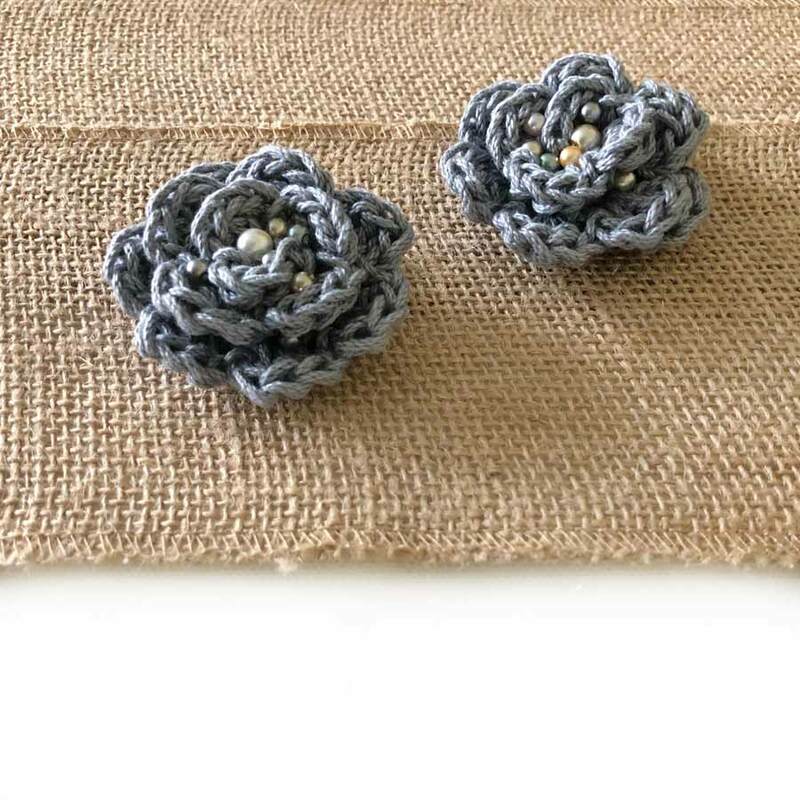 Third Style – Lace Lined Flower and Center Beads. 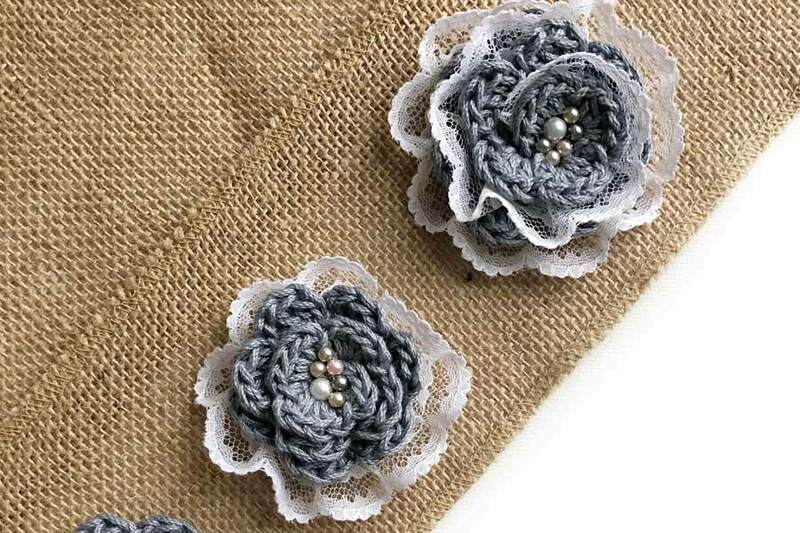 For this style you will add your lace prior to assembling your flower. As noted before, do not pre-cut your lace. Thread your sewing needle with your coordinating thread and begin to attach your scalloped lace as you did for the second style using the pleats. Again, you will be doing approximately one pleat per petal along the entire back of your unassembled flower. 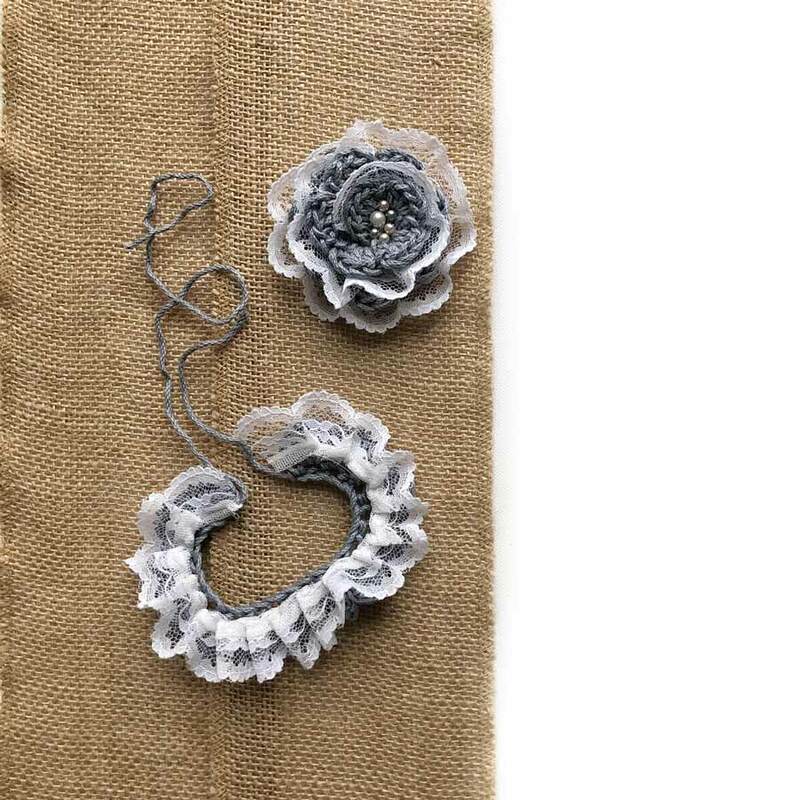 Once you have attached your lace around the back of your unassembled flower you can thread your yarn needle with the long tail and assemble it as you did with the other two styles. Finally, you may add your beads as you did in the same fashion as the First and/or Second Styles. For this part you can get creative! I did my test of this project using an unfinished wooden craft frame. The results were beautiful on the unfinished wood, very rustic. However, for my finalized project I used a pre-finished white-washed wooden frame. I wanted the final result to be a bit more shabby-chic than rustic. I feel that the white-washed wood accomplished that. So, get creative! 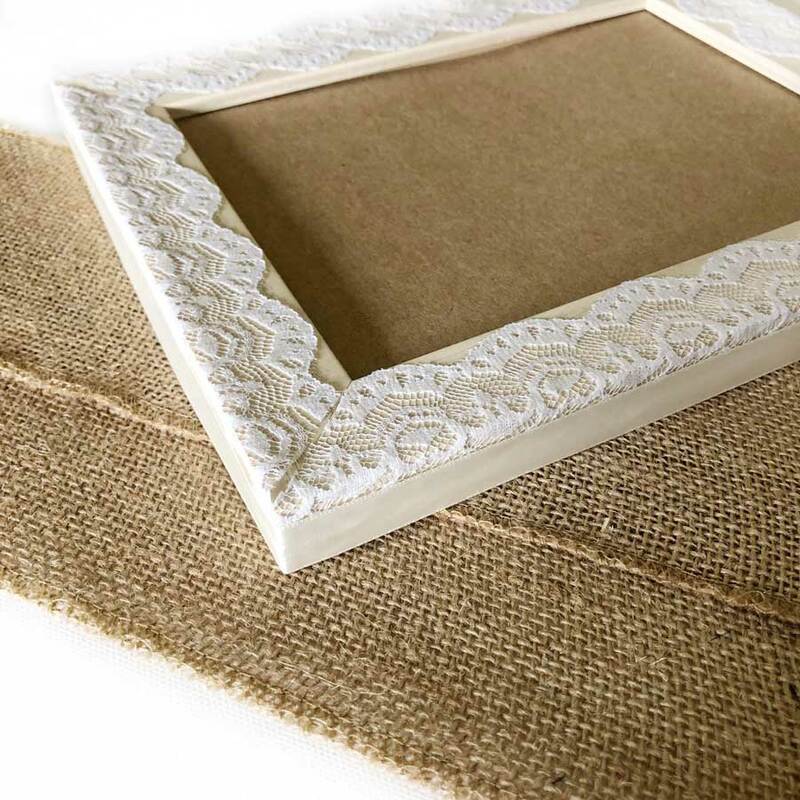 Maybe you want the unfinished wood, maybe you want to stain the frame dark and have the lace really pop! Maybe you want to go with off-white lace for a more antique look? Have fun with it! So lets get this part started! First, lay out some scrap paper, or newspaper to work on because this part can get messy. Put some of your craft glue in your small bowl and add a bit of water. Just enough so that when you mix it up the glue will spread a tad easier. Take your frame and lay out your lace to size it to your frame. Again, this is another place to get creative. Maybe you want to keep it simple and overlap the corners. Maybe you want to cut your lace on 45-degree angles and fit the edges together. Totally up to you and also dependent on the style of lace you chose. Once you have your lace pieces cut, start by coating one side of your frame using your paint brush and glue mixture. The lace I chose was wide enough to go over the edge. If you chose similar lace, be sure not to put the glue to close to the edge. I found that the lace would harden and it makes it difficult to wrap down the side of your frame later. Then place the piece of lace you cut for that side in place. 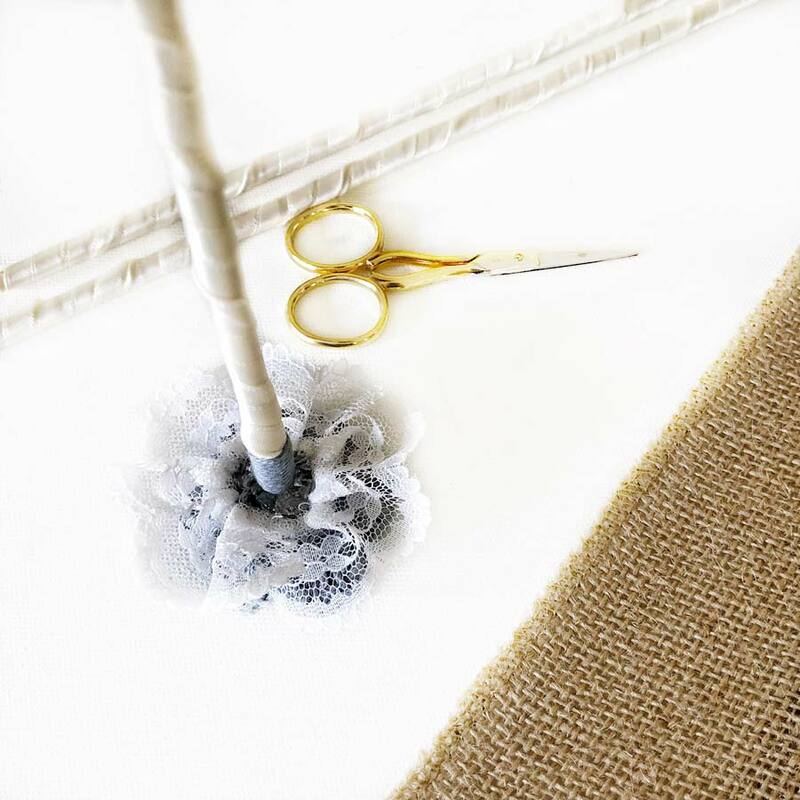 Brush over the top of your lace gently with your paint brush and glue mixture, again being mindful of the edge. Repeat this for the remaining three sides of your frame and let dry. Another place for creativity!!! I wrapped my flower stems in off white ribbon to have a bit of contrast against all of the bright white lace I used on my flowers! You don’t have to do the same! Maybe wrap yours in lace? Paint them? Or leave them bare! To wrap my dowels in ribbon I first put a dab of hot glue at the top. Then, I carefully placed the end of my ribbon, slightly angled, on the glue at the top of my dowel and slowly began to wrap the ribbon down while keeping an even tension. When you reach the bottom of your dowel with the ribbon add another dab of hot glue to finish off. I also chose to wrap one end of my dowel with the same yarn I used for the flowers. Just an aesthetic choice. 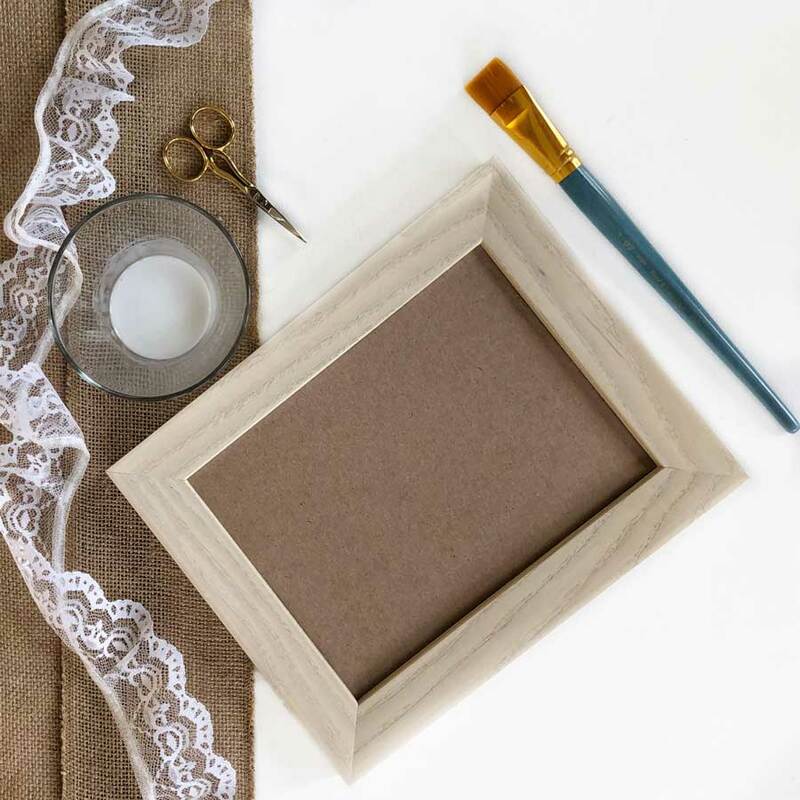 Now that your frame is dry you can brush your craft glue on the sides and fold the lace down around the edges. This can be a bit tricky to get the lace to stay, I added a few small dabs of hot glue to tack it down. Now, again depending on the lace and frame you chose, you can leave your frame finished like this, or you can glue ribbon around the outside edge to create clean finish if needed. Some frames I tested with were thin enough to completely wrap with lace, others were not and required a ribbon edge. Again, totally up to you. Using your hot glue gun, put a decent glob of hot glue on the backs of your flowers and press on your dowels. Take your mason jar and fill it with the glass beads and place your flowers to your liking! Add a picture to your matching frame and voilà, your amazing gift is done! You may need to make one for yourself because I know I wanted to keep mine! I hope you enjoyed making this project and that it puts a smile on the face of someone special! I loved putting this project together! You can find more of my projects and designs on The Life and Yarn Blog, make sure to sign up for my newsletter! For daily updates and inspiration come and follow along on Instagram @life.and.yarn! All the links to my Etsy, Ravelry, and Pinterest are in the top menu of my blog!